This listing is for all vintages of the Oude Geuze, but not for bottles specifically labelled "Oude Geuze Vintage". The cork pops & the smoke rises. Do I let it breathe, plug it & let it sit, chug it, cook it dinner, what do I do?!?! My dog sees my face frozen in confusion & immediately snaps me out of it with a piercing yelp. I stumble around & find my dusty tulip, give it a strong rinse, & proceed to pour. A hazy lemon orange honey pour settles in my glass & grows a rather porous white comb-over of head. The foam thickens up on subsequent pours, but we're on to more important things. The smell has already reached me, so I gain focus & get let a little closer. A sense of something pickled, sharp kiwis & tangy cantaloupe, something between semi-ripe watermelon & sour cherry candy(a fresh bag of sour skittles? ), plenty of salt, something like stale garlic, along with some dry grass & ethanol way in the background. It's so pungent. Why am I not offended? As it warms, the sourness flatlines some & turns a little wheaty. Letting the bottle last that long was a mistake on my part. Drink, drink! Thin & frothy, a lightly greased taste, but it leaves a dry feeling once it goes down(like I just licked a bunch of envelopes). My tongue is getting numb, am I going to die? Straddling the line of spoiled orange juice & yesterday's digestive juices, who can honestly say this is exactly what was intended so many years ago. Purple monkey dishwasher? Hand me a blank check & this replaces the juice in the fridge. The only reason I can't give it a 5 here is price. 750ml bottle poured into Sam Adams pint glass. 2014 vintage. Pours a slightly hazy golden yellow with two fluffy fingers of dirty white head that leaves splotchy lace as it recedes. Smell is mouth watering. Squeezed lemon, green apple, sour berries, white wine vinegar, sharp cheese, barrel wood, mild barnyard funk. Tastes of sour lemonade, more tart apple and berry, vinegar, soft cheesy funk, and oak barrel. Feels light and soft. Light bodied with fizzy carbonation. Finishes dry. Verdict: Vigorously recommended. A first rate beer, bought on sale for twelve Canadian dollars. I might as well have been wearing a ski mask. Huge tasting yesterday where we cracked open a vertical of Oude Geuze from 2010 to 2017. First part was blindly and we had to guess which vintage was in which glass, which was a fun game! A very nice experience, doing it blindly is the best too! October 2014 bottling into a snifter (so 1.5 years in bottle). overall a lovely beer. balanced, crisp and complex with tons of depth. My favorite 3F to date simply because it is so drinkable and refreshing without sacrificing depth and complexity. Appearance: pours primarily clear in a golden orangish color, in the class it is hazy and for the most part orange with a slight goldish hue. Very effervescent head that dissipates quickly, but has nice nucleation. Stunning appearance for a beer. Aroma: Cannabis is pretty dominant to me with this one, however it still works well with the other aromas. Lots of funk, little amount of straw, some lemon zest, and a very slight amount of Brett. Taste: Cannabis is immediate but is lost quickly with the subtle tartness, straw, lemon zest, slight orange peel and very light Brett. No earthiness present which is a bit surprising but with this beer it is actually pleasant. This beer is actually quite simple in flavor profile, but it’s simplicity is executed perfectly. It is still complex and has multiple levels of flavors to be discovered. Very well balanced and very tasty. Mouthfeel: This is one of the best mouthfeels for a sour I’ve ever had. It is not super resinous or acidic. Very light with the perfect carbonation, and the best part is the tartness dissipates quickly and actual flavors are the only thing that lingers. Overall: I think Cantillon makes a better Geuze, but when there is no Cantillon to be found, this will go beyond sufficing. Couldn’t pass this up in a bottle shop even if they have Cantillon! Appearance - Pours a nearly opaque dirty golden color, somewhat more orange at the core. A big fluffy white 2 inch head rises almost immediately and lasts for the entire glass. Smell - Intensely funky and musty. Barnyard, old leather, lemons, goat cheese and a hint of spoiled milk. More pleasant than it sounds. Taste - Wonderfully funky and sour, but not over the top in either character. Tart, unripe fruit is at the forefront here, with earthy undertones of oak and hay. A touch of vanilla is present in the background, leaving the faintest hint of sweetness on the tongue. Fairly low acidity makes this a very drinkable gueuze. My only gripe is that the finish could use a bit more oak; otherwise, this is top notch. 375ml bottle into a snifter. A - Straw colored, with a huge three fingers of pillowy head that recedes quickly to a spotty cap. No lacing to speak of. Great looking but fades too quickly. S - Bright citrus notes right off the bat, backed by some musty funkiness. Less grassy and more lemony. The funkiness is very forward. T - The citrus note is very prominent, like someone just squeezed lemon in my glass. There's a bit of leather, plus some hay and some just-took-your-shoe-off funkiness. No alcohol, just plain sunniness in a glass. Everything works perfectly here. M - Tale of two beers -- for the first few minutes, it's outstanding, effervescent and light, almost champagne-like. After 15 minutes or so, for some reason the carbonation seems to fade and it gives the impression of very light carbonation. D - The citrusy flavors, the effervescence, and the general lightness of the beer all contribute to a very high drinkability. I could sit and drink this for days. O - The only thing standing in the way of this being an every day beer for me is the price. $10 for a 375ml is a bit high, although it is an import. I wish they'd make something like this in the US. Appearance - Gold colour with an average size white coloured head. There is an average amount of carbonation showing and there is some fair lacing. The head lasted for around 4-5 minutes before it was gone. Taste & Mouth - There is an above average amount of carbonation and I can taste breads/grains, a dry yeasty flavour, tart lemons, and grapefruit zest. It ends with sort of stale barnyard type of dryness/flavour. Overall - Super refreshing and a lot of citrus sourness going on. Not as much lactic flavour as some of the other in the style and there is a lot of vibrant citric acid. A beer worthy of its acclaim. 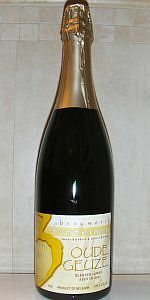 375ml C&C bottle into champagne flute. A - Pours a hazy golden orange, with a medium white head. T - Bitter mineral taste, tart lemon, green apple, a little sweetness sneaking in with the funk. Excellent. O - An excellent geuze, although i prefer Cantillon classic. When I opened the bottle it was a huge foam bomb, not sure if this bottle was over-carbed or what, but I did lose some to the sink (sadness). The beer pours with a huge head (due to the carbonation problem?) and the foam never really completely goes away, it just fades to a thin white coating. The beer itself is nearly entirely opaque (all the yeast was stirred up from the bottom of the bottle) and the beer is a very dark hazy yellow straw color. The nose is serious lemon and citrus, I mean honestly, this smells almost like lemon juice, it does this without being terribly acidic or tart smelling. There is also a definite whiff of funk and brett in there. The beer is sweet up front, this quicky fades to a 4/10 of sourness bit, which then gradually and very slowly fades to a very pleasant and mild musty dankness. There are multiple stages of flavor here, each subtle yet quite satisfying. This beer is MUCH less acidic than the Cantillon gueuze that I have had, it is also quite a bit more complex than the Lindeman's Gueuze. Overrall this beer is wonderfully complex and totally delightful. Buy again easy if I ever see it in stores here in Portland again. *Greg at the Bier Cellar told me they only got this beer as a "I'm sorry" gift from the distributor for something that had gone wrong but were told not to advertise it; glad I stopped by to grab one! Happiness defined, is hopsbreath munching on some blue cheese and drinking some high quality sour beer. I'm happy right now. 375ml bottle poured into a Duvel tulip. Purchased at Beamont Market in Portland for $9. Bottled December 10, 2009. S: Tons of raw brett. The funkier, more barnyard qualities are most dominate here. The lactic notes aren't quite as clean as a Cantillon Geuze, but Cascade Brewing has me a little burnt out on pure lactic sourness at the moment. I'm enjoying the deeper complexity of this. Pours a deep rich honey gold. With white head. Some cheese funk, red pepper spice, and cidery aroma. A little sweet red peppers up front, some mild apple cider character, some sour/tart hay. It's not too harsh or acidic. It's a touch citrusy. Actually, very pleasant to drink in that it's a little light. In some ways, it reminds me of a less harsh Iris. It's a little thin too. There's a faint bitterness on the finish that cuts the cider character nicely. It's an easy drinking gueuze as gueuze should be. I go back and forth with this, Tilquin, and Girardin as my favorite gueuze. It's a good one.